Jane Lerner is a writer and editor based in Brooklyn. BK Swappers was started by Kate Payne and Megan Paska in February 2010; Jane took over after both Kate and Meg moved out of town. BK Swappers is the most gratifying of the various food- and travel-related projects Jane is involved in, and she is honored to help bring together the amazing crew of Brooklyn swappers every couple of months. Would you like to participate in a food swap, maybe even host one yourself? This class will introduce you to the wonderful world of food swapping, and teach you how to start a swap in your own community—plus we'll all swap our own homemade goods at the end of the class! 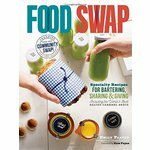 Jane Lerner from BK Swappers will explain the food-swap concept and show you how fun and easy it can be. You might have read about BK Swappers in this article from last year: http://www.nytimes.com/2011/03/13/nyregion/13barter.html. BK Swappers has been throwing food-swap events in Brooklyn for almost three years now, creating a close community of local home cooks and food enthusiasts. But maybe you don't exactly understand how a food swap works. This class aims to demystify the process of food swapping—Jane will explain the nuts-and-bolts of participating in an event and will give you the tools and materials to host one yourself. The class will also function as an actual swap! Please bring three (3) homemade food items to trade. The concept of a swap is best explained by experiencing one, so we will all have the chance to barter our homemade goods. You can bring three of the same thing (three jars of raspberry jam, for example) or three totally different items (e.g. one jar of raspberry jam, a small bag of cookies, one bottle of infused oil). As long as it's edible and you cooked, baked, created, grew or foraged it yourself, bring it on down to swap! If you have any questions ahead of the class, feel free to email bkswappers@gmail.com anytime.